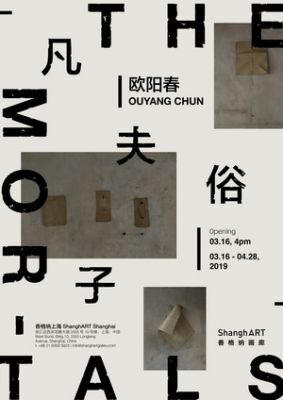 ShanghART Gallery is pleased to present Ouyang Chun’s solo exhibition “The Mortals” on 16 March. The Beijing based artist created his most recent and complex installation works by assembling massive amounts of furnitures and objects he collected from recently abandoned university residence buildings. The exhibition continues until 28 April. The raw materials Ouyang Chun used for the exhibition come from the old employees’ residence buildings of Xi’an University of Technology, where he lived with his parents in the 1980s. From May 2017 to March 2018, he went to Xi’an three times to look for materials before the whole compound was demolished. He collected nearly 12 tons of living rubbish deserted by the old residents, and carried them back to Beijing. In the late 1960s, the previous version of the university and its faculty members moved to Xi’an from Beijing due to political policy; they continued to live in that city for several decades. As they come from different areas in China, living in Xi’an became a challenge for them. Situated in the relatively conflicting and marginal area of the cultural psychology, they were living on “an isolated island”. Fully loaded with time and memories, these traces of the past were brought back to Beijing by Ouyang Chun. By assembling these objects without any artificial processing, Ouyang Chun, who was already over “Bu Huo Zhi Nian” (forty years old), retraced the previous “scavenging road” in his twenties, and revisited the “isolated island” sealed in his childhood memory. The installations presented in this exhibition dynamically continue some of the concepts the artist explored in “Infinity Column” and “Detritus”. The exhibition space has been arranged with the traces of living and aging: abandoned wooden door planks, glass table covers with old photographs still attached, rusty bed frames, dirty old suitcases, and bright-coloured plastic flowers covered in dust...... The artist constructed a “mortal world” that the viewers could first gain an overview from the platform, then walk through by crossing the “river”, and seeing the mammoth in the “nature” section of exhibition. Through a narrow opening, the viewers reach the second section “religion” where there are the entrances to “heaven” and “the mortal world” as well as the towering “stupa”. In the third section “human”, the smaller installation works on the second floor hint at the different social identities fulfilled by members within the family structure. In works such as “Papa” “Concubine” “Woman” and “King and Queen”, Ouyang Chun diverges from the common imagination of his materials and replaced the usual functions of these items to create figures that are humourous and melancholy at the same time. In the centre of the room, an isolated spaced is created by four walls that reaches the ceiling, with three viewing windows allowing viewers to peek inside. The impression of a solitary old professor’s home interior furnishing from the abandoned building is recreated. These unusual items left behind leave us puzzling over the internal world of their previous owner. Through the assembly of these objects, like building “lego” pieces, Ouyang Chun creates a world within the exhibition hall that revives the collective memory of a group of mortal men’s marginalised past, but also epitomes the lives of many who have been quietly exiled within modern Chinese cities. As the dust of ages scatters away, the unadorned strength of mortal lives remain luminous. Ouyang Chun was born in the 1970s and grew up in Xi’an. Having drifted away from the academic art education system, his experience of self-education determined his independent and versatile creative powers. Since becoming a professional artist in Beijing at 28, he has created works of painting, installation and sculpture, and draws inspirations from the contradiction and uneasiness brought on by the social upheavals of contemporary China. The subjects of Ouyang Chun’s paintings returned from the allegorical worlds of the early years to his personal experiences, juxtaposing worlds of fiction and reality, while pursuing absolute painting experience with his brushstrokes. His complicated life experiences and affection for the reality have contributed to his unique insight into the material world, forming compounded narratives and a strong perceptiveness for the broken and left behind. In his works of painting, installation and sculpture, Ouyang Chun often uses his guileless and vigorous brushstrokes and the forgotten objects to construct magnificent and intriguing landscapes and poetry. His major solo exhibitions include: The Mortals, ShanghART Shanghai, Shanghai (2019); A Drop of Dust, ShanghART Beijing, Beijing (2015); My Story, ShanghART Shanghai, Shanghai (2015); Detritus, BANK, Shanghai (2014); Child, Today Art Museum, Beijing (2012); Reveling In Rambling, Yuz Museum, Jakarta (2012); Painting the King, Belvedere-Upper Belvedere & Augarten Contemporary, Vienna (2011); Ouyang Chun - Painting the King, me Collectors Room, Berlin (2010). Works by the artist have been collected by Belvedere, Vienna, Austria; Me Collectors Room, Berlin, Germany; Long Museum, Shanghai, China; Power Station of Art Shanghai, Shanghai, China; White Rabbit Contemporary Chinese Art Collection, Sydney, Australia.